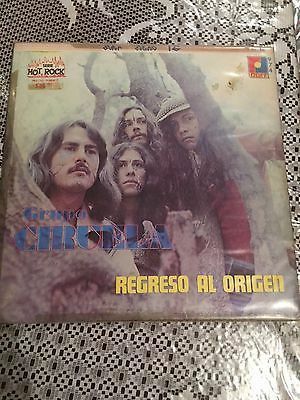 This is an auction for the megarare LP of Grupo Ciruela. "Regreso al origen". Made in México. YEAR:1973. Label:RAFF RF 942. CONDITION: Record: VG+. Cover: VG+, stains of lue on the edges, please see the pictures This record appears in Pokora's book "1001 Record Collector Dreams with three stars of rarity. SHIPPING COSTS: Mexico: 4 Dollars. USA and all America:12 Dollars. Europe: 22 Dollars. ASIA, AFRICA and OCEANIA: 28 Dollars. Thanks. Good luck! IMPORTANT: The shipping times from Mexico to Worldwide is between 1 and 3 months of SERVICIO POSTAL MEXICANO, please see patient. NOTE: If you want receive the parcel faster I can to send using other shipping company but to a higher price for the buyer. VERY IMPORTANT: THE SHIPPING COST TO USA IS 12 DOLLARS, IS NOT 4 DOLLARS.